Select Compute, and then select an operating system. In this tutorial, Windows Server 2016 Datacenter is used. Resource group Select Create new and enter myResourceGroup. Under Network Watcher Agent for Windows, select Create, under Install extension select OK, and then under Extensions, select OK. Accept the defaults for the remaining Settings and select OK. Under Create of the Summary, select Create to start VM deployment. 3 Authentication type Paste your SSH public key or select Password, and enter a password. 3 Resource group Select Use existing and select myResourceGroup. The VM takes a few minutes to deploy. Wait for the VM to finish deploying before continuing with the remaining steps. Create a connection monitor to monitor communication over TCP port 22 from myVm1 to myVm2. On the left side of the portal, select All services. Start typing network watcher in the Filter box. When Network Watcher appears in the search results, select it. Under MONITORING, select Connection monitor. Status Reachable Lets you know whether the endpoint is reachable or not. AVG. ROUND-TRIP Lets you know the round-trip time to make the connection, in milliseconds. Connection monitor probes the connection every 60 seconds, so you can monitor latency over time. Hops Connection monitor lets you know the hops between the two endpoints. In this example, the connection is between two VMs in the same virtual network, so there is only one hop, to the 10.0.0.5 IP address. If any existing system or custom routes, route traffic between the VMs through a VPN gateway, or network virtual appliance, for example, additional hops are listed. STATUS The green check marks for each endpoint let you know that each endpoint is healthy. Alerts are created by alert rules in Azure Monitor and can automatically run saved queries or custom log searches at regular intervals. A generated alert can automatically run one or more actions, such as to notify someone or start another process. When setting an alert rule, the resource that you target determines the list of available metrics that you can use to generate alerts. 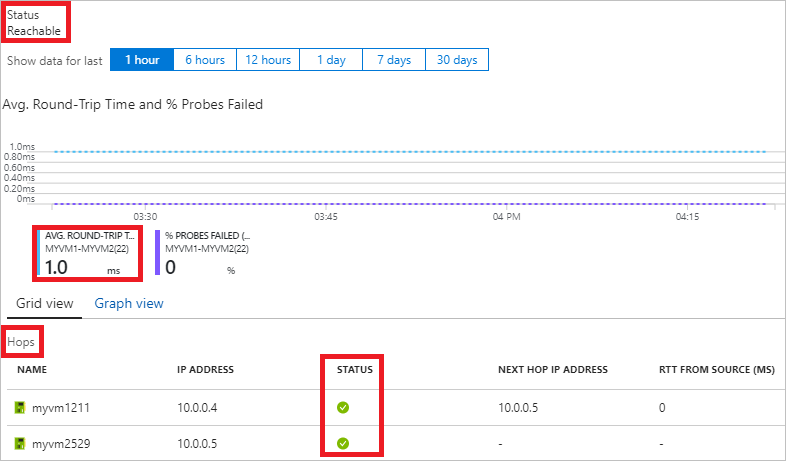 In Azure portal, select the Monitor service, and then select Alerts > New alert rule. Click Select target, and then select the resources that you want to target. Select the Subscription, and set Resource type to filter down to the Connection Monitor that you want to use. Fill out the alert details like alert rule name, description and severity. You can also add an action group to the alert to automate and customize the alert response. In the search box at the top of the portal, enter myResourceGroup. When the myResourceGroup resource group appears in the search results, select it. Select the myVm2-nsg network security group. You can see that there's a red exclamation icon in the status column for the myvm2529 network interface. To learn why the status has changed, select 10.0.0.5, in the previous picture. Connection monitor informs you that the reason for the communication failure is: Traffic blocked due to the following network security group rule: UserRule_DenySshInbound. If you didn't know that someone had implemented the security rule you created in step 4, you'd learn from connection monitor that the rule is causing the communication problem. You could then change, override, or remove the rule, to restore communication between the VMs. Enter myResourceGroup in the Search box at the top of the portal. When you see myResourceGroup in the search results, select it. Enter myResourceGroup for TYPE THE RESOURCE GROUP NAME: and select Delete. In this tutorial, you learned how to monitor a connection between two VMs. You learned that a network security group rule prevented communication to a VM. To learn about all of the different responses connection monitor can return, see response types. You can also monitor a connection between a VM, a fully qualified domain name, a uniform resource identifier, or an IP address. 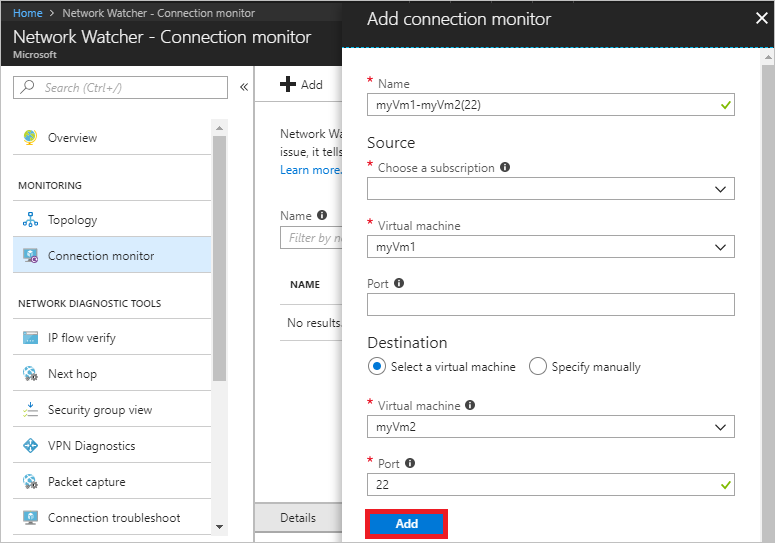 At some point, you may find that resources in a virtual network are unable to communicate with resources in other networks connected by an Azure virtual network gateway. Advance to the next tutorial to learn how to diagnose a problem with a virtual network gateway.